Beautiful beaches, fascinating national parks and a variety of activities, including world-class fishing and diving, await visitors to this largest province of Costa Rica. There are the tropical and humid transition forests that characterize the Santa Rosa National Park with it’s extensive savannas and Rincon de la Vieja National Park. Before arriving at it’s exciting fumaroles – known as “Las Pailas” – you can walk through thousands of trees, and contemplate a huge diversity of birds and butterflies as well as lush vegetation. Fascinating mud cones of different sizes and shapes continually bubble before your eyes. Originally part of Nicaragua, the Nicoya region was annexed to Costa Rica by popular vote on July 25,1824 and although it is very much a part of the country, it is distinctive not only in its terrain, but also in its culture. 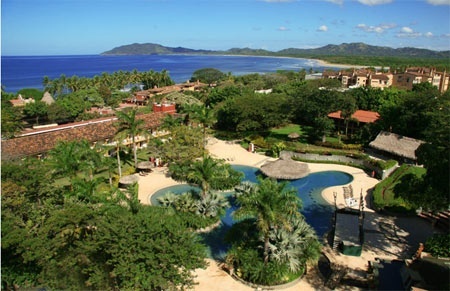 The perfect time to visit Guanacaste is, luckily enough, year-round. The dry season affords the serious sun worshipper with plenty of tanning time, while the “green season” brings the trees into bloom with explosions of color and fragrances. The beaches along Guanacaste’s shore – Hermosa, El Coco, Flamingo, Tamarindo, and Nosara are some of the most beautiful beaches in Costa Rica. With a drier, more arid climate than other parts of the country, this area offers a wealth of water sports: surfing, world-class sport fishing, snorkeling, scuba diving, etc. On some parts of the coast there are beaches where Leatherback and other Sea Turtles come to lay their eggs. Leatherback/ October-March- Flamingo, Playa Grande, Tamarindo Pacific Green/ July- December – Santa Rosa. By road take the Interamerican Highway west and then north towards Liberia. There are also several airstrips serviced regularly by the country’s domestic airlines, Sansa & Travelair. If sun is what you’re after, sun is what you’ll get in this region. Temperatures can rise to the mid 90’s F. with little or no breeze during most of the year. Dry season lasts from November through April and cools down a bit during December and January. Rainfall is not a problem for the better part of the year. Hats, sunglasses, and long-sleeved cotton shirts are essential when visiting parks in the area. Shorts, comfortable trail shoes, and sandals should keep you comfortable. Plenty of water is a must when hitting the trails and try to get to them as early as possible in order to avoid the worst of the day’s heat. Bolaños Island Wildlife Refuge is a great place to visit and serves as a nesting site for brown pelicans and magnificent frigate birds. The River Corobici makes up in wildlife what it lacks in whitewater.